Everyone wants the latest and the fastest, so at the end of it you get stuck with something old, used and slow by today's standards. No, we weren't talking about your wife/husband, we were talking about your computer. So, what do you do with an old computer that you think is slow? Dump it into a garbage can or stow it off on eBay? Nah, here are some creative uses for an old computer. Use it like a Photo and Music server. As long as you have plenty of hard disk space you won't hit a problem. Dump all your music CDs on it if you want. Connect it a flat screen and play a slide show of your photos. Plug in your Internet connection, or a network cable via your broadband and you can make that old slow computer into a Internet browsing station for yourself and your friends when they come home. As an added benefit you can restrict the Internet access of the old computer as much as you want with some Firewall/Internet Security software and give it your kids to browse from. Put in Linux and convert the old PC into a full functional file/storage server that you can dump in the attic or garage. If you are short of disk space just get a bigger hard-disk. Need to try out Linux or some obscure software, why not use your old computer for it? You can use it learn hard disk recovery skills or open it up and do some good old hardware surgery. Now, that's a good idea. All you need is a power inverter, a device that converts 12V to 120V power. So, you can listen to music from the hard-disk or play VCD/DVDs while you are riding in a car, RV or a boat. Of course, if you are going to watch stuff instead of listening you will need a small LCD display as well. Load up Linux with Shorewall/IPtables or just install IPCOP to convert that old piece of hardware into a very powerful router or firewall. This by far is one of the best recommendations I always give to friends who run small offices. No old computer is slow enough for Linux or to work like a router/firewall. Why not setup a Shoutcast server and stream all your MP3 files to the world? or stream videos or a webcam feed, which you can watch from anywhere. You can also connect a inexpensive webcam and place it near any place you want to monitor, throw in a internet connection at the back and you have your own personal security monitoring station. Keep a watch from anywhere. Drop in a TV tuner card and you can watch TV with your computer and do neat stuff like Time Shifting. Or if install MythTV or FreeVo to make it into a fully functional Tivo/VCR and record TV programs. Okay, it may not run all the very latest stuff but it will still be powerful enough to play some of the best games. You can load all your favorite games you have played on it or load some arcade games like Pacman and make it into a gaming station for yourself or for guests. Get a pair of joysticks or gamepads as well to complete the experience. Instead of trashing it, why not upgrade it? Of course, that idea may not apply to some of the very classic stuff like the 386 machines, but you can upgrade most of them in some or the other way to make them more powerful - some new memory, hard disk or even a new video card could make quite a lot of difference. Sometimes you can use stuff from your old computer to replace things in your new computer or some other computer of an emergency aid, stuff like additional memories or a power supply. This is a dangerous thing but what the heck if you want to vent your anger for all those crashed Windows sessions, you old PC could be the perfect guinea pig. Connect it with X10 to automate your home and your old PC is capable enough to switch on heaters and lights or keep a watch on intruders. Or just load up and answering machine software and let it handle voice mail for you. Why do you need to pay for a voice mail service when your PC can do it for free? If you don't want to do anything with your old computer, you can still get a good deal by exchanging it instead of trashing it or selling it on eBay. Companies like HP and IBM have such computer exchange programs, often referred to as trade-in programs. Lastly, you can always get some goodwill by donating it away to someone in need. It can be anyone you know - your relatives, kids or someone else like a school. You can see some of those nifty TI-99/4As for sale really cheap on Ebay (eBAY ?). My Sinclair ZX81 got lost in SLC, Utah. Youngsters probably have no clue about that one. I never play games and cannot see fast moves nowadays. Any ol' cheapie with XP or better is good enough, Win 7 Pro has been a rather impressive splurge. I like it! When I left Michigan in 2011 the starving unemployed were grabbing all old appliances, computers, whatnot, working or not. I don't know where the loaded pick-up trucks went, but apparently someone was paying a little, maybe a computer salvage and restore guy, many such shops were around there, and many go overseas for my same suggestion as here. Help those students! ! It is quite a good option to donate the old computer to schools and charity organizations, but before you actually do it, one thing you care about the most is the private or important information in the computer, can it be restored and seen by the prying eyes. 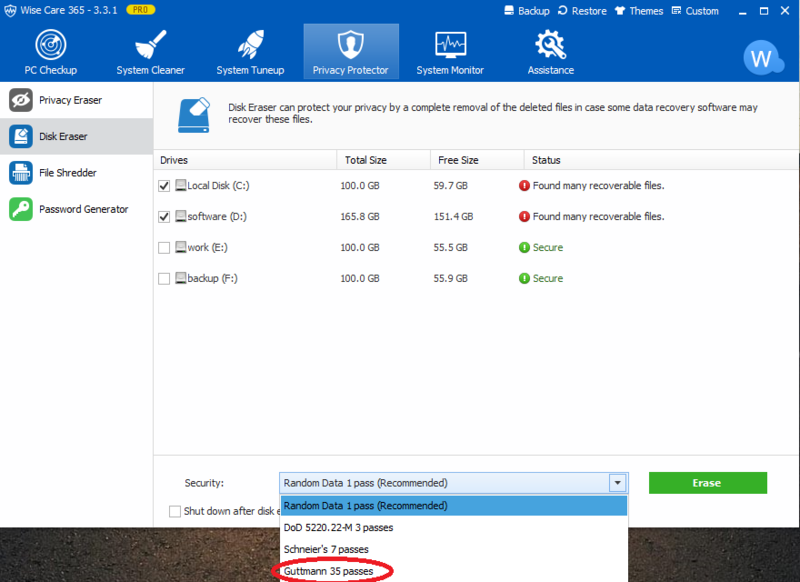 Here I strongly suggest you have a complete cleanup with Wise Care 365 Pro and erase the disk with Disk Eraser in Privacy Protector column of Wise Care 365, do remember to choose 35 passes. Then all the information deleted and cleaned will not be restored. with 3 or 7 passes is also enough i think... or what you mean?